William T Doherty was born in Airdrie in 1879, he was first apprenticed to the licensed grocery trade and for a period was located at Blackridge, West Lothian, around 1905 he was transferred to the Cowcaddens Ward. He then took over Mr Shanks public house in Cowcaddens in 1913. Mr Doherty became heavily involved in the Scottish De fence work and became a member of the committee, he was also a director of the Scottish Legal Life Insurance Society, having offices in Bothwell Street and was elected to the town Council in 1920 to 1939. He was one of the first lab our councillor's on Glasgow Corporation and became a magistrate and deputy chairman of the Corporation. He was the first Roman Catholic to be convener of the Corporation education committee. Corporal William T Doherty (see portrait on the right) was with the Royal Air Force, he was well known as a representative with Thomas Usher and Sons, Ltd. William was the eldest son, he was educated in Abbey School, Fort Augustus, his first situation was with a well known Glasgow firm of stock brokers where he remained for three years. Thereafter he decided to enter the trade and assumed a position with Messrs Watson and Middleston Ltd, Glasgow of "Ballochmyle" Scotch Whisky fame, later he joined the firm of Usher's, acting as one of their representatives for the West of Scotland. In the early days of the war he took an interest in civil defence and during the blitz of 1941 he had some thrilling experiences while on duty as a special constable. 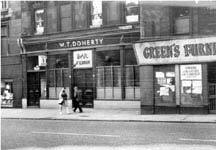 Glasses of Champagne for the customers of W T Doherty, 80 Cowcaddens, 1967.. The occasion was after Celtic F. C. had won the European Cup. 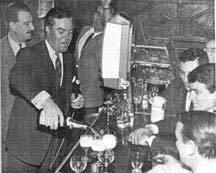 Seen filling the glasses was Bill Tennent, Scottish Television personality. The customers had been watching the television broadcast of the match in the premises and naturally, there was jubilation as they saw Celtic put on a tremendous performance to win the trophy. The S T V cameras were in the premises for a live broadcast of the programme "Here and Now" immediately after the game. Viewers was Bill Tennent and Mr Doherty also behind the bar interviewing some of the customers, asking them what they thought of the game. Here are some principal personalities who attended the smoker dinner held at Belmont House, Glasgow, by the Cowcaddens Ward of the Glasgow Association in 1962. 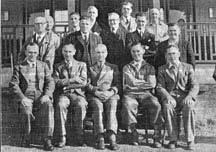 Left to right: Mr G Ramster, Glasgow Association Office; Mr H Doherty, Symposium Bar, Cowcaddens Street; Mr N Jones, Cross Keys, St. Peter's Street; Mr J Dougan, Dougan's Bar, Springburn Road; Mr R Lemon, Lemon Tree, Parliamentary Road (Ward Convener); Mr W J Bennet, Port Dundas Road; Mr W B Gow, Bristol Bar, Cowcaddens; Mr J Lanagan, Maitland Street; Mr T F Flynn who succeeded Mr Gow as president of the Glasgow Association; Mr D McNiven, Argyll Arms, Kennedy Street; and Mr W J McDowall, Secretary, Glasgow Association.